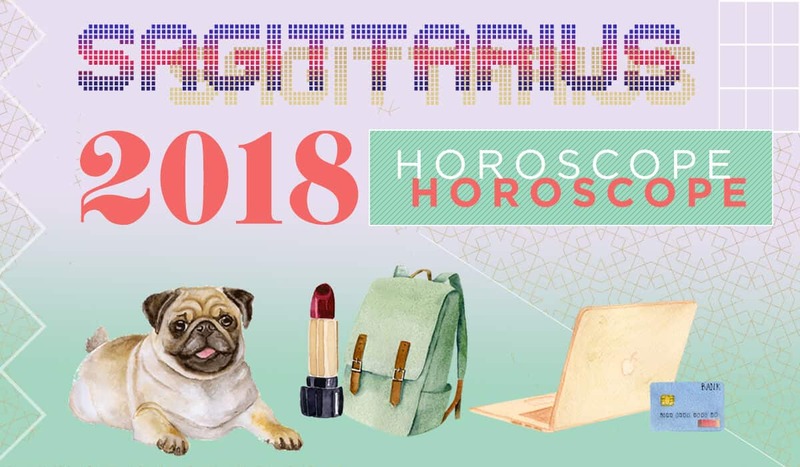 What does your Sagittarius 2018 horoscope hold for your Sun sign? A transitional year is in store, so embrace a more flowy pace instead of swimming upstream. Work your magic behind the scenes, then prepare to make a grand debut again in November! You’re a make-it-happen person, but every 12 years, life does something weird: It refuses to cooperate with your enterprising and managerial ways. Your ruling planet Jupiter is in your twelfth house of closure and endings, wrapping up a 12-year life cycle that began back in 2006. In 2018, trying to force things will be a useless battle. You’ll only find yourself swimming upstream! But when you stop resisting the universe’s plans (which, believe it or not, might actually be in your best interest! ), things divinely fall into place. Cultivate a practice to help yourself surrender and tune into the divine flow: meditation, music, art, chanting, swimming, charity work, journaling. Heal with a therapist, do some forgiveness work, face old demons. There’s a whole world of support out there once you just. Let. Go. Besides, those sacred whispers of your intuition will soon get loud enough for you to trust that they’re leading you somewhere awesome: to the November 8 transit of Jupiter into Sagittarius. This will be the dawn of a new 12-year chapter, one that will make sense of all the struggle or things that fell away. Turns out you didn’t need them anymore. Now, move forward with a clean slate and clear conscience. No more drama? Hotheaded Uranus, the planet of sudden change, starts its departure from your fifth house of love and passion mid-May, after a seven-year sprint. But with your ruler, Jupiter, in your fantasy-fueled twelfth house until November, you could be swept off your feet this year. Is this person your soulmate…or just passing through? It could be hard to tell. Mid-July, an eclipse in your intimacy zone could find some Archers saying “I do.” Other Sags may go through a breakup or a life transition that takes a lot of emotional energy to process. Give yourself that space. You’ll emerge from the cocoon to spread your wings when Jupiter enters Sagittarius for 13 months in November. You’ve grown up so much, Sag, thanks to maturity-planet Saturn’s three-year visit to your sign from 2014 to 2017. Now, frugal Saturn is bringing structure to your finance sector, pushing you to budget and prioritize long-term security. Build that nest egg, Sag! You may need to live leaner, but your sensible approach will pay off over time. An exciting joint venture or unexpected windfall could arrive at the July 12 Cancer solar eclipse, which illuminates your wealth sector. In 2018, there are also two full moons in Cancer, on January 1 and December 22, which could bookend your year with bountiful bonuses. With Jupiter in your restful twelfth house until November, you could be sleepier than usual. Wave the white flag and focus your energy inward toward spiritual pursuits, healing and self-discovery. Trying to force an agenda will be an exercise in frustration, but when you surrender and let the universe guide, miracles will occur. Luckily, you’ll be saved from couch potato status mid-May, when innovator Uranus sweeps into your health and fitness zone for an eight-year visit. Get ready for an extreme makeover to your diet, fitness and lifestyle—one you’ll probably welcome. Energy vampires, begone! With Jupiter in your twelfth house of hidden agendas, “user-friendly” types will be exposed. Cut those codependent cords and get relationships back on healthy ground…or move on. Four eclipses this year bring new opportunities for friendship, travel and learning, so stay open to new people and experiences. Your mother or a female relative could be a healing force from May through August, as Jupiter forms a golden trine to compassionate Neptune in your maternal fourth house. Bonds deepen with women and children and you may be inspired to learn more about your own lineage.